First Impression Before you run maingame.exe, run gbfinal.exe . It just blows you away! 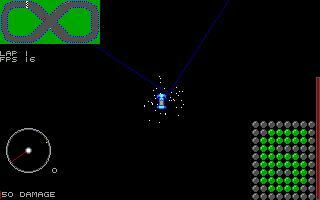 An excellent 3D racer in QBASIC! (Too bad that's not the game.) Now run maingame.exe . Wow, a really good racing game! You race against 5 other cars on a variety of tracks getting ever harder. It's a really cool game, but it's a little hard. What It's Like You drive a car in an attempt to beat other racers until your car is destroyed. You start out in last place, and it's tough to get back to first - even on the first track! Oh well. Other things you should know Cool graphics. There's supposed to be 3D wireframe graphics, but I don't see any. 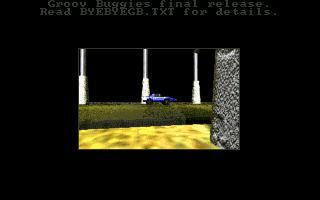 This is a really cool game with a very smooth and cool engine! Great job, Pasco! Sound Awesome sound blaster music! It's perfect for a racing game! Flexibility/Features A lot of great extra stuff in this game! You can win money by beating people and buy power ups for your car at the end of the level, your car can have a "blast" that speeds it up every couple seconds, you have damage points, a circular speedometer, and a lot of other really cool things. 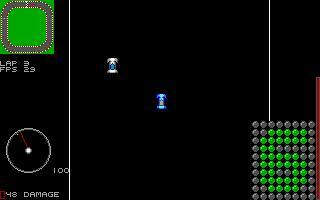 Gameplay/Control Arrow keys make you move, space makes you shoot forward every couple seconds, and that's about it. The control is a little loose for going around curves, and you slow down a lot. I don't like that, but overall, the program's control is pretty good. Overall Impression Cool effects and many features. Great AI, pretty realistic, okay graphics, and many other really great things! This is a great program! Get it today!